What is "Natural" as far as Beekeeping is Concerned? I recently posted at Beesource (where I go by the handle "WiredForStereo") about what is natural. The discussion was about using foundation-less frames instead of foundation, small or large cell. You'll find that post weaved into this post. For the uninitiated, many years ago, beekeepers decided to start having bees grow on larger cells with the expectation that larger bees would equal more honey. Many years later, this led to problems with mites, both varroa and tracheal, or so is the view by some. While the cell size itself has been proven in university studies to have no direct affect on mites, some including myself view small cell (4.9mm cell diameter) to be part of a holistic approach to beekeeping. While some of the small cell fervor has waned, it still has its proponents. Now, more and more, there seem to be beekeepers raising bees without foundation like in the olden days. Essentially, they put in an empty frame into the hive and let (hope) the bees draw out something useful. Often it works wonderfully, with the bees drawing out beautiful worker brood comb at a high rate of speed. Likewise, often it goes horribly wrong with bees drawing out terribly messy, crossed, or crooked comb, or full frames of drone comb. I'm starting to see foundation-less as a fad-ish kickback to the small cell crowd. There's been large cell popularity, then there was small cell, and people thought this one thing was the panacea, but it isn't, and university studies prove that. Then people get all philosophical and decide "what do I know, I'm only human, certainly the bees know better than I do." Then we get this crosshatched mishmash of natural and unnatural methods where you get a couple great combs of worker, and then a bunch full of drone. Trying to do something "natural" inside a sawed and planed nailed together painted fully dismantle-able and often mobile "hive" with movable frames is like pretending jumping out of a plane and flapping your wings is "flying." You're lying to yourself. Whether there is foundation in there or not, you're lying to yourself. It's unnatural. It's unnatural. It's unnatural. Deal with it. Keeping bees is unnatural. Hacking down a tree and stealing the honey out of it is natural. So if you want to do it "natural" go, be my guest. But if you think owning a hive is natural, you're simply lying to yourself. Bees are animals. When we use them for our ends, they are livestock. Should we next decide that cows should not be fenced in because it's "unnatural"? Surely the cow knows better than I do about in which field she belongs. Right? That's the whole point. I want that cow in my field. I want those bees to build comb in my hive on my frames so I can get in there and make sure these wild "tamed" (get it, because they're gentle) are doing what I want so I can get honey and wax out of the deal. On top of all that, I want them to do it without me having to dope them up to keep them alive. And I don't want that dope in my honey either. How do I pull this off? Then I hear about people using "natural" treatments. What is that supposed to mean? Are you telling me that FGMO naturally occurs in hives as a miticide so we should use it too? Nonsense. Hogwash. Hose-water. Load of hooey. My great uncle did foundation-less, and all his bees are dead, he's dead too. What does that have to do with anything? Nothing, but I've seen more better believed in correlations around here. So here's what I'm going to do. I'm gonna keep using small cell because it's like being foundation-less, ONLY WITH FOUNDATION!!!! Those of us on small cell know for a fact that bees on small cell build whatever they want because we spend a good portion of our time making sure we give them foundation at the right time of year so they will draw it out well. Then we take the poorly drawn and excess drone stuff and use it for honey. Another aspect of my beekeeping is survivorship. I do my best to let bees die that can't hack it in the real world. Bees have been the property of beekeepers for so long, that they have been weakened genetically, or so is my thesis. I know it hurts to watch a hive die. I have seen so so so many do it. But that's how it works in the wild. Bees that can't live within their means in the winter die. Bees that can't move around in the cold die. 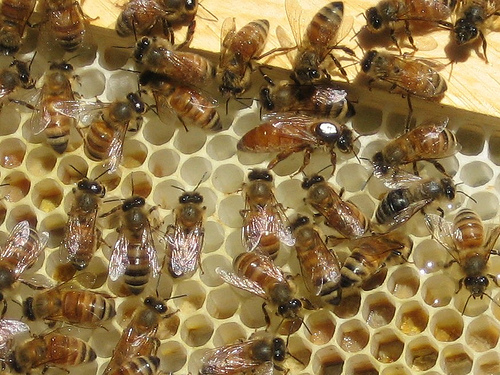 Bees that can't fend off disease die. Bees that don't raise good queens die. This is how the world works. The survivors go on to the next year to swarm and reproduce. Their genetics go on. This is the process of natural selection. While I freely admit and promulgate the idea that beekeeping is not natural per se, the best solution for keeping them as livestock lies in keeping their genetics as close to natural as possible. Doing all that allows me to market "organic" or "natural" honey. That honey fetches a premium price because it is free of chemicals, local, and unprocessed. It also allows me to keep bees for much less money and headache, though as I mentioned before, watching hives die can be quite stressful. Next time, my plans for increase this year. I'm attempting to go from 5 to 16. Are these signs of skunks? What you are looking at appears to be poo made of bees. The bees in the hives on the bricks had hauled out a bunch of dead bees, now they're gone and replaced by these bee pellets. Tell me what you think. Many of you had a big snow storm in the last few days. I had one hive that had a very small cluster and I knew they were in trouble going into the storm. They had literally two dozen bees or less. With a small cluster, a hive cannot keep warm and simply freezes solid. The dead hive was purchased as a five frame nuc from Don Kuchenmeister the "FatBeeMan" in Georgia. I've come to the conclusion that while his bees are pretty good, they just aren't as able to handle the winters here. That's why I'm attempting to add some colder weather stock to my collection this spring. Healthy sized clusters, probably that of a softball or larger, are able to survive by huddling tightly together and keep warm by vibrating their wing muscles. If they are making enough heat, they can move about the hive as a cluster to find stored honey and keep fed. Also, if the cluster is not large enough, they cannot keep warm enough to move and may starve. On the other hand, large clusters need a lot of honey to maintain operations. So it is imperative that they have enough honey to survive the winter. Thus far, I have forgone a late season harvest so that the hives have enough honey to last the winter. It's part of the more biological/natural/organic method of beekeeping. Because I still have not been able to produce enough honey to keep an emergency store for bee feeding, I still need to feed sugar syrup from time to time, but I always put food coloring in it so that I know not to harvest it as honey. However, as I only feed when necessary, the sugar syrup is concentrated around the brood nest and never in the supers, I have never actually seen dyed honey when harvesting.